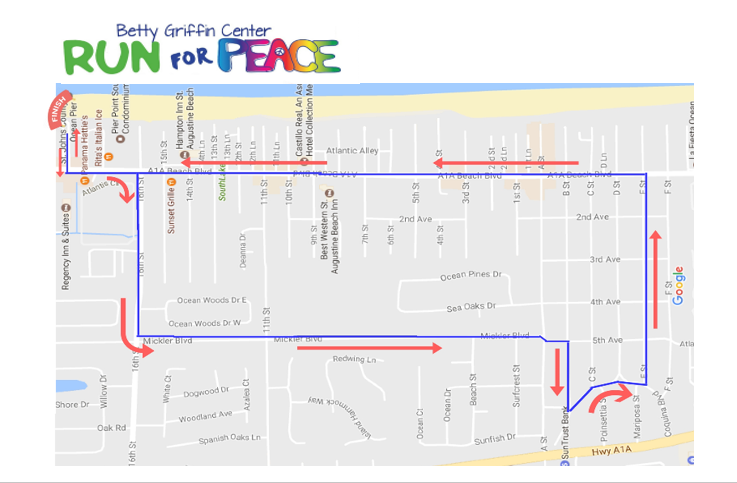 This Saturday, April 13th, the 6th Annual Betty Griffin Center Run for Peace 5K will take place around St. Augustine Beach, beginning and ending at the St. Augustine Beach Pier. All proceeds from the race go to benefit The Betty Griffin Center. The Betty Griffin Center is a full service domestic and sexual abuse center located in St. Johns County. The primary purpose of the agency is to provide holistic services that directly relate to the victims’ experience of abuse which will increase safety and security for both the victim and the family. There are still ways you can help for the race. Become a race participant, sponsor or volunteer. To learn more about the race and the Betty Griffin Center visit the race website by clicking HERE. We would like to make you aware the race route will bring runners through your area between 8 am to approximately 9:30 am. Have fun being part of this race or just come on out and give support!